Southwest Dairy Day on Oct. 20 will feature technology and herd management practices used by the Sherman and Avila families at Avi-Lanche Jerseys dairy, 13390 U.S. Highway 385, north of Dalhart, Texas. Southwest Dairy Day is hosted annually by the Texas A&M AgriLife Extension Service, rotating between the dairy areas around Stephenville and the Texas Panhandle, said Ellen Jordan, AgriLife Extension dairy specialist in Dallas. The open house at the dairy will begin at 10 a.m. and conclude at 3 p.m., with riding tours from 10-11:30 a.m. and 12:30-2 p.m., as well as a noon program. 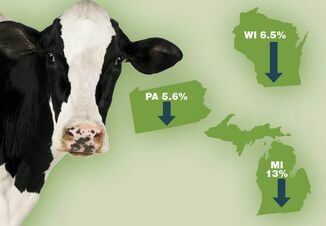 Two dairy outreach program area, or DOPA, continuing education credits will be offered. Avi-Lanche Jerseys was started in 2007 in the Texas Panhandle by Richard and Jennifer Avila in a partnership with D&E Jerseys and Jennifer's parents, Don and Elsa Sherman. Jordan said she selected Avi-Lanche to highlight this year because of the advanced technology and practices they are using to take care of their animals and protect the environment. 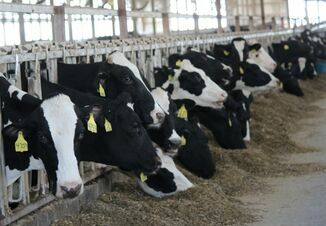 The dairy is 95 percent Jersey cows with 3,475 heifers, 800 of those on a calf ranch, The dairy produces about 145,000 total pounds or 16,860 gallons of milk daily. They have seven Saudi barns for shade and protection and a double-30 parallel parlor for milking. The dairy employs 32 people and includes 2,500 acres to raise corn, triticale and alfalfa. Monitoring Compost, Brent Auvermann, AgriLife Extension agricultural engineer, Amarillo. Forage Sorghum Silage Management, Jourdan Bell, AgriLife Extension agronomist, Amarillo. 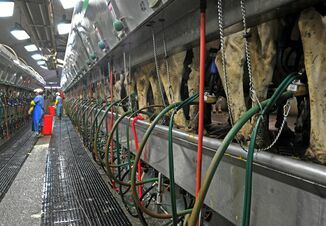 The tour will also include stops at the milking parlor, maternity barn, through the Saudi-style barns, commodity barn and embryo-transfer barn. Irrigation Management, Tools and Tips, Dana Porter, AgriLife Extension irrigation engineer, Lubbock. Comparing the Cost and Returns and Profitability of Crops, Steve Amosson, AgriLife Extension economist, Amarillo. Two separate tours to an alfalfa field will be at 11 a.m. and 2 p.m. with Calvin Trostle, AgriLife Extension agronomist, Lubbock; and Leonard Lauriault, New Mexico State University forage crop management scientist and superintendent of the Agricultural Science Center at Tucumcari, New Mexico. A noon luncheon, courtesy of Hi-Pro Feeds, will include Travis Miller, AgriLife Extension interim associate director, College Station, and members of the Sherman and Avila families providing an Avi-Lanche Jerseys farm overview.